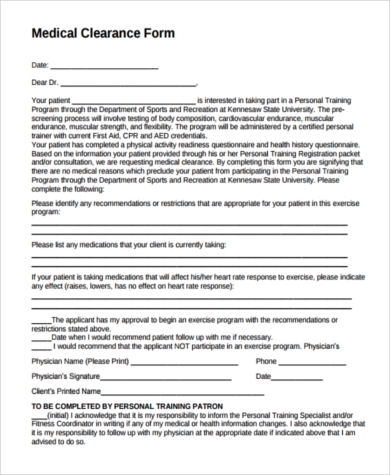 A medical clearance is an assessment of a person’s health to ensure that he is fit enough before doing certain activities like joining a sports league, starting a new job, or undergoing certain surgeries and medical procedures. It is useful to make sure that there are no underlying medical conditions that may jeopardize the health and safety of the person and the people around. 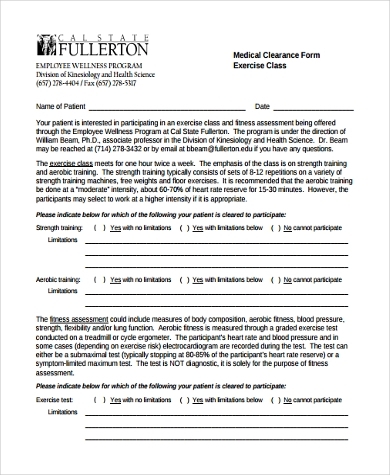 It may just be another requirement or form, but if you think about it, it is a really good opportunity to make sure that you are healthy. 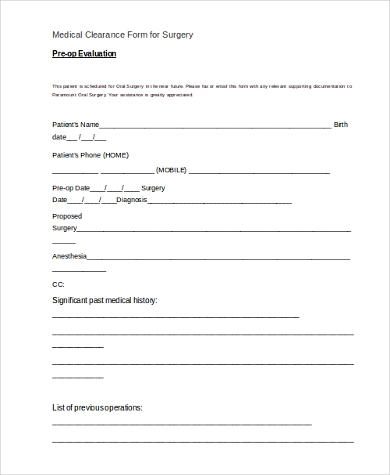 You may also look at our Sample Medical Forms for additional forms that are required by hospitals or any medical institution. 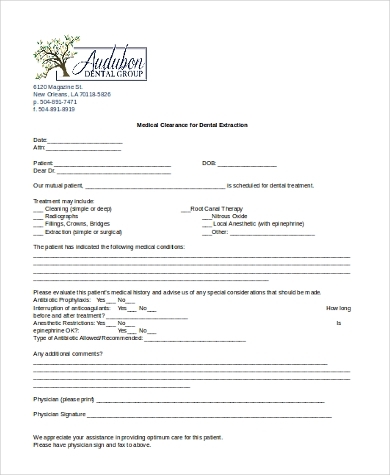 The following forms are downloadable and easy to use. You will surely find one that suits your needs. Certain cardiovascular diseases: The decrease in air pressure may pose a threat. Deep vein thrombosis: Immobility of the legs during a flight increases the risk of this. Respiratory problems: The decrease in air pressure and mild hypoxia can be dangerous. Pregnancy: This is applicable if the pregnancy is greater than 28 weeks and if there is a history of premature delivery. Anemia: Due to an anemic person’s low hemoglobin levels, they are at risk of hypoxia when flying. Ear, nose, and throat problems: Due to the decrease in air pressure, a person with these problems will have to be checked by an ENT specialist first. Whatever the situation may be, the main point is that medical clearances are required to make sure a person is physically fit. 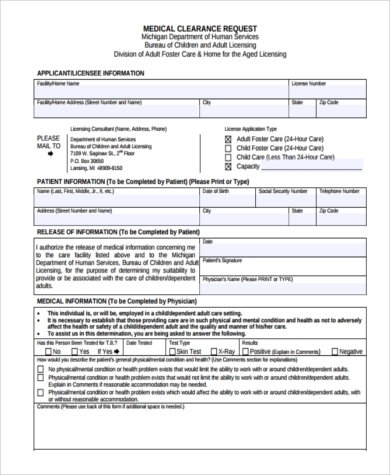 Some institutions may also require medical history forms for information on a person’s past illnesses that ultimately may have effects on their current health condition. 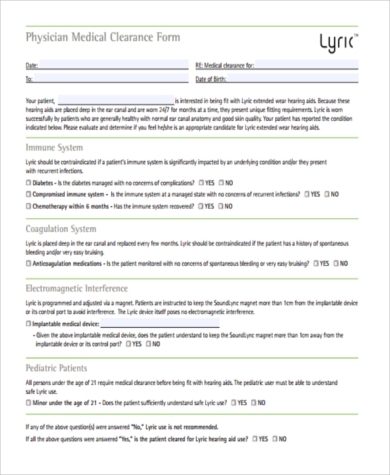 For this, you may look at our Sample Medical History Forms. Our health is very valuable. That is why there are numerous laws mandated by the government regarding health, and that is why medical clearances are important. When your health is ensured, you are able to perform your tasks to the best of your abilities and live your life to the fullest. 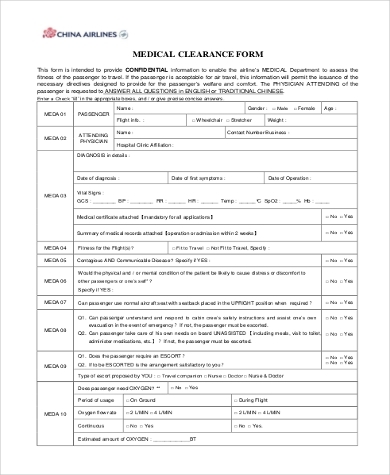 Aside from the ones on this page, there are various Sample Medical Clearance Forms that you can check out for more information.